Welcome to our 2-minute guide to faults causing red lights on Vokera boilers. The red light on the display panel indicates a fault with your boiler. The way in which the light is flashing will help indicate the problem. For those that have a digital display, the red-light fault indicator should also be coupled with a fault code. This helps to indicate the exact fault with your boiler (because lights on their own are not specific enough). For example, on a Vokera Compact you might see a A01 fault code with a red flashing light, which indicates there has been a failure in the ignition sequence. Whilst we can explain a few possible causes below, lights on their own don’t help to indicate the exact problem. Boilers are gas appliances, and problems are difficult to diagnose. Always contact a Gas Safe engineer to get the problem fixed. You can do that here. If the red light is on but the green light is off, this signals a safety based lockout. If the red and green lights are on for Vokera boilers such as the Linea, there’s another list of problems. The following could be the case whether the lights are solid, or flashing. If it’s water pressure (which is a common problem), there’s a good chance the lights are flashing on and off together for a few seconds at a time. If you’re unsure why the red light goes off, but the green light stays on – with most Vokera boilers that’s normal. The green light is a flame indicator. So, when you turn on your heating, the green light should stay on. Unfortunately, the lights on the display panel of a Vokera boiler don’t give enough detail into a fault. If you’re looking for an engineer to help fixed the problem, you can get help here. 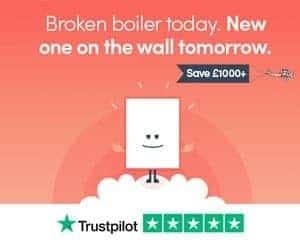 Prefer a new boiler? Get a Worcester Bosch on the wall from as little as £1,795 (finance available) here. Try and to make a note of any fault codes you see, anything unusual (i.e. boiler is leaking, making sounds, or not heating up radiators) and speak to a qualified engineer to help fix the problem.